Venous leg ulcers develop mostly in elderly patients with chronic venous disease. 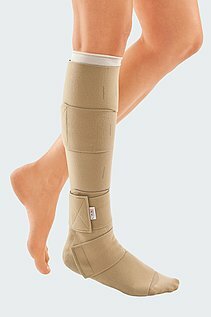 As a rule, treatment of the ulcerative wound on the calf that heals poorly consists of treating the wound itself as well as adjunctive compression treatment with special compression stockings. medi offers solutions for both treatment steps. All the products in medi's wound therapy concept are simple to use. This enables the patient to become his or her "own therapist". The possibility of carrying out all the treatment steps on their own gives the patients back a little independence. The patient is more flexible and actively contributes to his or her own successful treatment. medi's products reduce the number of doctor's and therapists' appointments. 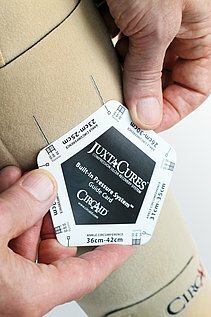 Patients can apply and remove their compression garments on their own. This is particularly valuable for personal hygiene. 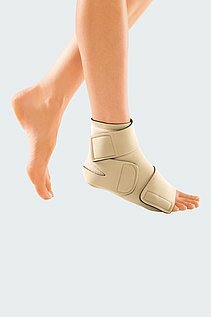 After showering, the patients can put the compression garment back on themselves without needing an extra visit from the therapist. 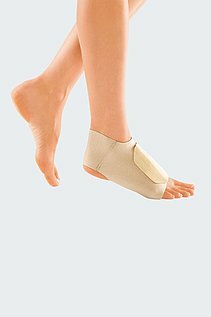 In addition to self-management, medi's products allow patients to wear their own shoes. This guarantees mobility, which, in turn, supports therapy and improves quality of life. medi's wound treatment products restore some of the patient's independence, improve quality of life and contribute towards successful therapy. Once the wound has closed, the patient should continue to wear compression garments to maintain successful treatment in the long term. 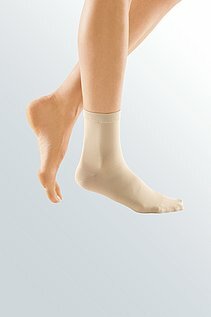 medi offers effective and attractive compression garments for this as well. Venous leg ulcer can be caused by a number of different factors: while the most common cause is a narrowing of the veins, arterial disease can also lead to this clinical picture. The circulatory disorders often develop as a result of diabetes. The risk of developing venous leg ulcer increases with age: all in all, 1 - 3% of the population has already had a venous leg ulcer, whereby a disproportionate number of these patients are over 80 years of age. The most risky aspect of a venous leg ulcer is the danger of infection, because the wound heals very poorly indeed and is thus vulnerable to bacteria that can cause inflammation of the ulcer. Treatment of venous leg ulcer consists of acute treatment of the symptoms, so that the wound can heal more easily. 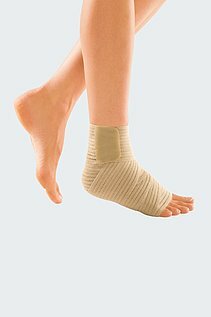 Special compression stockings should also be worn to support this. They promote the circulation and thus prevent a new wound from developing. medi offers a solution for both treatment steps. UCS Debridement is available for treating acute cases: this is a highly effective means of cleansing and caring for the ulcer. 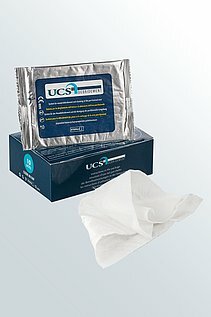 UCS Debridement is a special cleansing cloth that patients can use themselves. Thanks to its special structure, it effectively removes necrotic tissue and debris to keep the wound clean at all times. The cloth moistens the wound edges to boost healing. But treating the symptoms alone is not enough for treating venous leg ulcers effectively: the cause must be treated too, in order to reduce the likelihood of a recurrence of the ulcer. 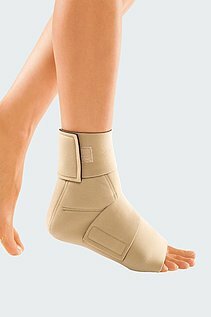 medi offers various types of compression treatment for this. mediven ulcer kit - the tried-and-tested dual-component system - is suitable for acute treatment: the compression garments have an antibacterial silver coating that prevents infections of the wound. 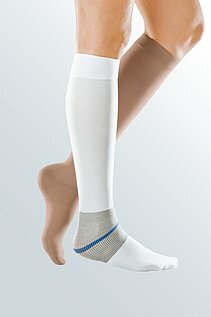 medi also offers a broad range of specially made compression garments for aftercare and long-term prevention of recurrence of venous leg ulcer.